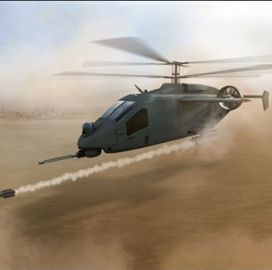 L3 Technologies and AVX Aircraft Company have designed a compound coaxial helicopter as a joint offering for first increment of the U.S. Army’s Future Attack Reconnaissance Aircraft-Competitive Prototype program. The CCH platform is designed to operate in contested airspace and complex environments for an extended period of time, L3 said Monday. Both companies intends for the system to employ a single-engine framework, small form factor, high-speed forward flight and avionics based on modern open systems architecture. “We are collaborating to deliver a prototype that provides powerful leap-ahead capability for our warfighters at an affordable life-cycle cost,” said Christopher Kubasik, chairman, CEO and president of L3 and a 2019 Wash100 winner. The team aims to meet all FARA requirements and exceed 70 percent of the criteria for light-attack and reconnaissance missions with their helicopter offering.